With bone tumor findings in musculoskeletal radiology, the radiologist’s main goal is to assess whether the lesion is benign or aggressive and to determine if further workup is required. The authors demonstrate how contrast-enhanced MRI helps determine tumoral extent and risks, how CT may reveal occult, pathologic fractures, and how scintigraphy may be used to distinguish between monostotic and polyostotic lesions. Bone tumors are a relatively infrequent finding in musculoskeletal radiology. When evaluating osseous lesions, the radiologist’s main goal is to assess whether the lesion is benign or aggressive in appearance and whether further workup is required. The list of potential osseous lesions is extensive; this review of bone tumors does not include metabolic or degenerative lesions. To provide a meaningful differential diagnosis to the referring clinician, several characteristics of every osseous lesion should be routinely assessed. Classically, 10 radiographic features of a bone lesion should be examined. Five of these include: zone of transition (ZOT), presence or absence of periostitis, location in the bone, pattern of osseous destruction, and age of the patient, along with associated symptoms. [1–3] Additionally, determining if the process is mono-ostotic or polyostotic can be very helpful. Because these characteristics are so important to properly classifying bone tumors, more should be said about each. Eosinophilic granuloma. (A) Frontal radiograph and (B) coronal reformatted CT images from a 2-year-old boy with a high ESR and no fever. The lesion has ill-defined margins and an associated periosteal reaction. Nonossifying fibroma with secondary aneurysmal bone cyst formation. Lateral radiograph (A) and (B) axial T2-weighted MRI with fat saturation of the distal tibia in a 14-year-old boy. The radiograph shows a mildly expansile lytic eccentric metaphyseal lesion posteriorly in the distal tibia. The MRI shows the lesion to be mildly loculated with central low signal and a thin rim of high signal, and a single lobule with a fluid-fluid level due to secondary ABC formation. Giant cell tumor of bone. 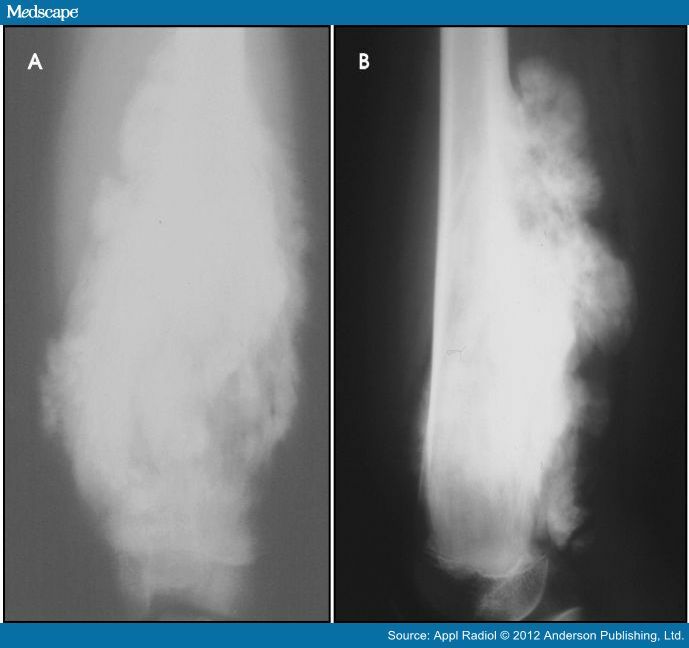 (A) Frontal radiograph, (B) surface-rendered 3D CT and (C) repeat frontal radiograph taken 3 months later of the distal forearm in a 27-year-old woman. The expansile lytic subchondral nature of the lesion and in this case its very aggressive increase in size over 3 months is well demonstrated. Simple bone cyst. 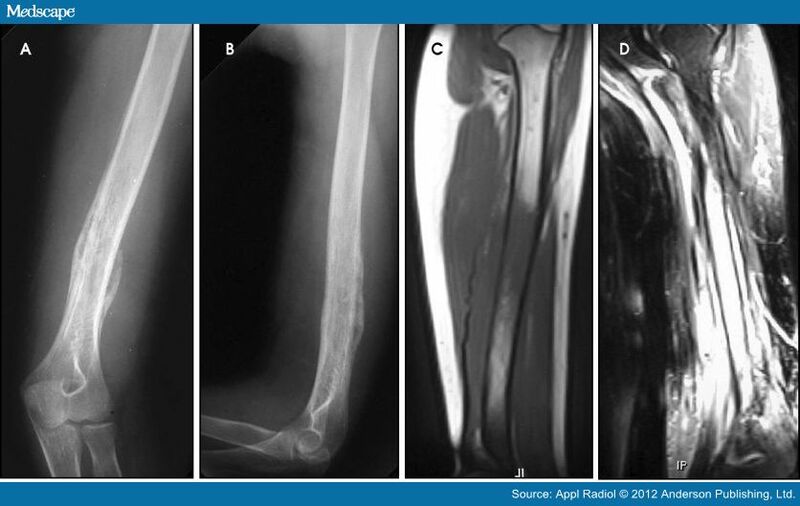 (A) Frontal and (B) axial radiographs of the proximal humerus in a 5-year-old boy. There is a well-defined lucency of the proximal humeral metaphysis with a pathologic fracture. In this case there is no fallen fragment sign as can occur when a fracture fragment migrates through the fluid to lie dependently. Enchondroma. (A) Frontal and (B) oblique radiographs of the distal femur. The lesion has the classic appearance for this location with a rings-and-arcs pattern of calcification in a central metaphyseal position. Multiple myeloma. Axial CT image through the pelvis of a 68-year-old woman. Note the diffuse permeative pattern of bone destruction. The propensity of lesions should suggest myeloma or metastases in this age group. Osteogenic sarcoma. (A) Frontal and (B) lateral radiographs of the tibia/fibula in a 15-year-old boy demonstrate a proximal tibia diaphyseal aggressive bone-forming tumor with a large soft-tissue mass. The periosteal reaction has an aggressive “Sun ray spiculation” pattern. Two additional pieces of information that can be extremely helpful are the age of the patient and the presence or absence of pain. Some lesions, such as Ewing ‘s sarcoma and primary osteosarcoma, are seen overwhelmingly only in the pediatric, adolescent, and young adult populations. Likewise, EG, chondroblastoma, solitary and aneurysmal bone cysts are rarely seen in adults >30 yrs. Moreover, while infection, metastatic lesions, and aneurysmal bone cysts typically present with pain, discomfort is rare (in the absence of trauma) with fibrous dysplasia, enchondromas, and solitary bone cysts. Several other characteristics, such as the presence of sclerotic margins, soft tissue involvement, a pattern of bony destruction, endosteal scalloping, and the pattern of matrix calcification, can also aid in diagnosis. Although plain radiographs, computed tomography (CT), magnetic resonance imaging (MRI), and radionuclide studies may each provide additional information, suspected soft-tissue extension of an osseous lesion should be evaluated further with contrast-enhanced MRI to determine not only tumoral extent but also the risk of complications like neurovascular compromise. Also, MRI may help narrow the list of differential considerations by demonstrating cystic or necrotic components, encapsulation, contrast enhancement and the presence of fluid levels (Figures 2, 8, 9) or peritumoral edema on MRI. Dedicated CT may show occult, pathologic fracture in an otherwise benign-appearing but painful lesion. Aneurysmal bone cyst. (A) Lateral radiograph, (B) axial bone and (C) soft-tissue window CT and (D) axial T2 with fat saturation MRI of the distal left tibia in a 25-year-old man with aneurysmal bone cyst. Note the expansile nature of the lytic lesion with a thin rim of intact bone and the multiple fluid-fluid levels from the stagnant pooling of blood on the soft tissue CT and MRI. Telangiectatic osteosarcoma. (A) Frontal radiograph, (B) MDP bone scan and (C) axial T2-weighted MRI with fat saturation show a lesion in the lateral aspect of the right distal femur meta-epiphysis of a 19-year-old man. This version of osteosarcoma is relatively lytic compared to the conventional osteosarcoma, but it shows marked uptake on MDP. The axial MRI shows multiple fluid levels, strongly suggestive of the diagnosis. Scintigraphy with Tc99m–MDP bone scan can determine whether a lesion is mono-ostotic versus polyostotic in nature. The following is a brief description of each of the 15 most common benign and malignant osseous lesions the radiologist is most likely to encounter. As mentioned previously, solitary bone cysts tend to be centrally located, painless lesions occurring almost exclusively in patients <30 yrs These tumors appear lytic, have a narrow ZOT and are most often located in the proximal humerus and femur (Figure 4). There is no periostitis unless an associated fracture is present. A fracture through an SBC may show the classic “fallen fragment” sign, which is fractured bone that has fallen to the most dependent portion of the cyst. [3,4] As expected for a cystic structure, the MRI appearance of these lesions shows hypointense T1 and hyperintense T2 characteristics. This painless, typically metadiaphyseal lesion can be monoostotic or polyostotic. When polyostotic, fibrous dysplasia is overwhelmingly (90%) located on one side of the body. The ZOT is narrow and the lesion itself can be quite heterogeneous with a lytic, sclerotic, or mixed appearance (Figure 10). When located in the pelvis, fibrous dysplasia can often appear lytic and bubbly while rib lesions may have a ground-glass appearance and be expansile. Involved tubular bones are expanded and demonstrate cortical thinning. In the hip, this can lead to varus angulation and a “Shepherd’s crook” deformity of the femoral neck. [3,6,8,10] The skull base and calvarium are also common sites of involvement. There is no periostitis and the age range of affected patients is broad. The MRI appearance is nonspecific, typically showing T1 prolongation and variable T2 intensity. Fibrous dysplasia. (A) Frontal and (B) magnified view of (A), views of the left tibia/fibula in an 11-year-old boy. Note the mildly expansile nature of the dysplastic bone with cortical thinning and on the expanded view the ground-glass nature of the bone matrix. This geographic, lytic lesion is classically described as having 4 qualifying characteristics when found in the long bones. It is eccentrically located, has a sharp nonsclerotic ZOT, abuts subchondral bone, and almost always occurs in individuals with recently closed physes (Figure 3). The most common locations are distal femur, proximal tibia and distal radius. However, atypical locations such as the pelvis and calcaneus are also seen. [3,6,7,9,11] In these cases, giant cell tumors need not conform to the above criteria. These lesions are usually mono-ostotic; however, polyostotic tumors or satellite lesions are rarely seen and can be difficult to differentiate from metastatic GCT. Periostitis is not present. There is low signal on T1 and variable T2 MRI signal, which may include hyperintense regions or fluid levels secondary to aneurysmal bone cysts. Eosinophilic granuloma (EG) could also be called the great mimicker of osseous lesions. While EG typically is found only in patients<30 years, there are a few other discriminating characteristics. For example, EG may appear lytic, sclerotic, mixed or “moth-eaten” (Figure 1). The ZOT can be narrow or wide. Associated periostitis may cause this lesion to appear aggressive. Infrequently, a bony sequestrum may be present; however, this can also be seen in osteomyelitis, fibrosarcoma and primary lymphoma of bone. [3,6,8,12] Most EG lesions are monoostotic, but younger patients are at higher risk for developing polyostotic disease. Enchondromas are centrally located, geographic, and predominantly lytic-appearing lesions, which almost invariably contain a chondroid matrix when found in the long bones (Figure 5). These monoostotic, painless lesions may show endosteal scalloping; however, there is no associated periostitis. Enchondromas may be difficult to discriminate from low-grade chondrosarcomas, but the latter is more likely in a history of pain, cortical destruction or soft tissue extension. Large or proximal lesions have an increased rate of malignant transformation. In contrast, enchondromas found in the hands and feet may be polyostotic, but they rarely undergo malignant transformation except in Ollier’s disease or associated with soft-tissue hemangiomas, as in Maffucci’s syndrome. [3,6] Chondroid matrix is conspicuously absent in these peripheral lesions. This lesion arises from the metaphyseal region of the long bones as a bony excrescence contiguous with the medullary compartment that characteristically points away from the adjacent joint. Osteochondromas are typically solitary, appendicular lesions, which cease growing after the skeleton matures (Figure 11). Growth after this point, cortical erosion, or thickening of the associated cartilaginous cap is rare, but suggestive of malignant transformation into chondrosarcoma. [3,6,14,15] Multiple hereditary exostoses are a rare, autosomal dominant, polyostotic form of the disease that has an increased risk of malignant transformation. In patients <30 years, osteosarcoma and Ewing ‘s sarcoma are the most common primary malignant tumors of bone. Osteosarcoma can be subdivided into medullary, parosteal, periosteal and telangiectatic, all of which carry different prognoses and treatment options. Medullary osteosarcoma (Figure 7) is the most common, occurring in adolescents and young adults typically between the ages of 15 and 25 yrs. These are rapidly growing, heterogeneous, metaphyseal lesions that show cortical destruction, aggressive periostitis, and a wide ZOT. Osseous matrix formation is the norm and a soft tissue component is often present. Evaluation with MRI shows variable T1 and T2 signal characteristics secondary to varying degrees of ossification. High T2 signal is often seen around the periphery of the lesion, presumably related to adjacent edema. Metastatic skip lesions are commonly seen and should be worked up with radionuclide evaluation. Parosteal osteosarcoma (Figure 12) originates from the parosteal soft tissues and is less aggressive than the medullary form. This lesion typically occurs in older patients. Growth is circumferential around the involved bone and typically does not initially result in cortical destruction. As such the prognosis for this lesion is more favorable. However, if intramedullary extension does occur, the prognosis is more guarded. Parosteal osteosarcoma. (A) Frontal and (B) lateral radiographs of the distal femur in a 16-year-old male demonstrate florid new bone formation projecting medially, laterally, and posteriorly. Ewing’s sarcoma. (A) Frontal and (B) lateral radiographs, (C) sagittal T1 and (D) coronal T2 with fat saturation MRI of the left humerus in a 15-year-old girl with arm pain and a mass. There is a permeative mixed lytic and sclerotic lesion involving the distal humeral shaft with accompanying periosteal reaction. The MRI shows a nonspecific low T1, high T2-signal pattern and soft-tissue involvement. Chondrosarcoma. 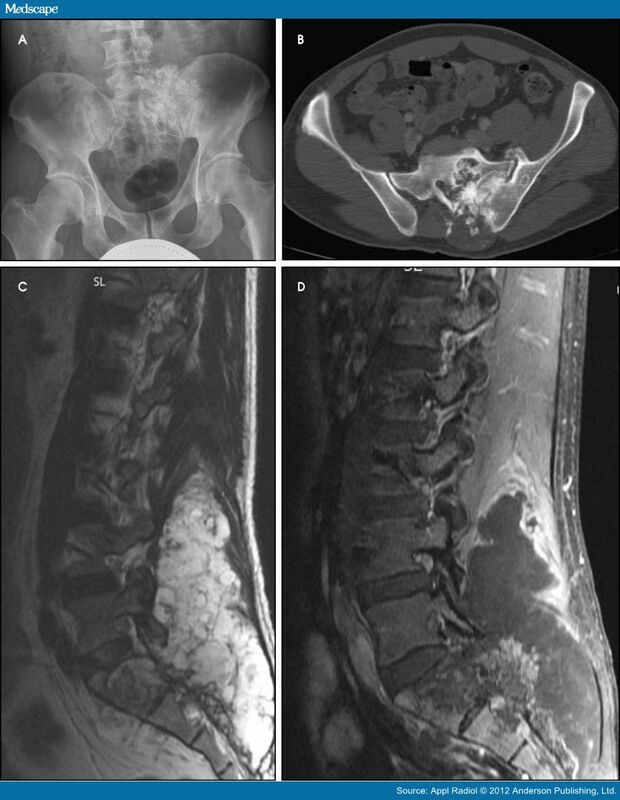 (A) Frontal radiograph, (B) axial CT, (C) sagittal-T2 and (D) sagittal-T1, fat-saturated, post-gadolinium MRI of a 34-year-old man with a sacral chondrosarcoma. There is a large necrotic tumor with enhancing margins surrounding the central rings-and-arcs pattern of calcified matrix arising from the sacrum. This article has reviewed the commonest benign and malignant bone tumors the radiologist is likely to encounter. To construct a meaningful differential diagnosis, an attempt should be made to characterize the lesion as having either an aggressive or a benign appearance by assessing such qualities as the zone of transition, periostitis, pattern of lysis, and location. A careful and methodical analysis will help the radiologist determine if the lesion is likely benign or if additional workup or biopsy should be considered.